In the summer of 2013, popular resistance succeeded in stopping the demolition of Gezi Park, one of the last public green spaces in Istanbul. Yet urban transformation and development projects have continued throughout the city at a dizzying pace. Nearly every neighbourhood in Istanbul today grapples with some new high-rise, luxury apartment complex, shopping mall, or freeway. Each of these projects fits in its own way within the Turkish government’s broader vision to transform Istanbul into a giant, glittering harbour of wealthy global elites. In recent years, the ruling AK Party and its developers have also turned their attention outside the city. Three integrated megaprojects –the 3rd Bosphorus Bridge, the 3rd Istanbul Airport, and the Canal Istanbul– now threaten to decimate the last forested and agricultural areas surrounding Istanbul. But the social and ecological consequences promise to be devastating both within the city center as well as in its surrounding areas. Ecologists, urban defense activists, and local villagers are working together to fight back, becoming part of the broader global trend for urban and rural movements to work together. Northern Forests Defense (NFD/ KOS), based in Istanbul, is a diverse organization that brings together those working to protect their living spaces against this coordinated onslaught of “creative destruction”. Founded in 2013 as part of the rising struggle after the Gezi Park resistance, NFD’s primary goal is to protect the diverse ecological zone extending from Lake Sapanca to the Strandzha Mountains (an area that consists of the last forest lands, watersheds, and farmlands outside Istanbul). They also promote a non-hierarchical framework, where human communities are considered to be an integral part of the natural world. Today, Northern Forest Defense is working together with Istanbul City Defense, a large network of groups against destructive development based within the city, to stop the megaprojects. Their campaign is called “Stop the Killer Projects: Be the Breath of Istanbul”. 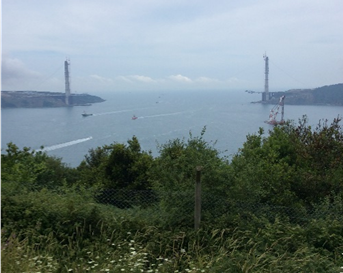 The Third Bosphorus Bridge (pictured below), is already under construction. Spanning nearly 1,500 meters, this suspension bridge will soon be the 8th largest in the world. The third Bosphorus bridge, under construction. Source: Author. Traffic from the third bridge will connect to another megaproject which is still in early stages of development: the Istanbul New Airport. This airport (Istanbul’s third) is planned to be the largest airport in the world. Construction will require 76.500.000 square meters of land, 80% of which is forested. 660 hectares of rare wetlands will also be destroyed, with important drinking water tributaries and ponds either destroyed or filled up with waste, and with a vast expansion of urbanism in the last remaining green areas of the city. Yet both these projects pale in comparison to the government’s most recent scheme: the Canal Istanbul. This enormous man-made waterway would spread all the way from the Black Sea down to the Sea of Marmara- splitting Istanbul’s European side in two. The concept for this “second Bosphorus” was first developed by an Ottoman sultan nearly 500 years ago. Today, the Erdogan regime hopes to use it to commemorate the 500 year anniversary of the conquest of Istanbul. These three major projects would lead to hundreds of other secondary projects –roads, shopping centers, parking lots, office high-rises and apartment blocks– and completely transform the ecological systems of the region. Such large-scale deforestation will accelerate the process of Istanbul becoming a “heat island”, an urban bubble where heat has no means of escape. As activist Onur Akgül explained to me, “The average temperature in the city is already rising, and with the completion of these projects, the city’s average temperature will be risen by 2 or 3 degrees in time. [Without the forests] Istanbul will become a real hell on earth”. Countless rural communities will also be destroyed. In this region, the economy is based primarily on herding animals. Without open grazing areas, villagers will have no choice but to withdraw their animals, leave their homes, and migrate to the already overcrowded city. Like much of the world, rural villagers and urban dwellers in Turkey experience deep cultural differences. However, as the climate crisis worsens, the city and countryside must work together to pose viable alternatives to a destructive society based on endless economic “growth”. Northern Forests Defense is just one example of a new wave of ecology groups who are beginning to forge these kinds of alliances. On May 30th, NDF/KOS was invited to support a protest march at the proposed site of the third airport. 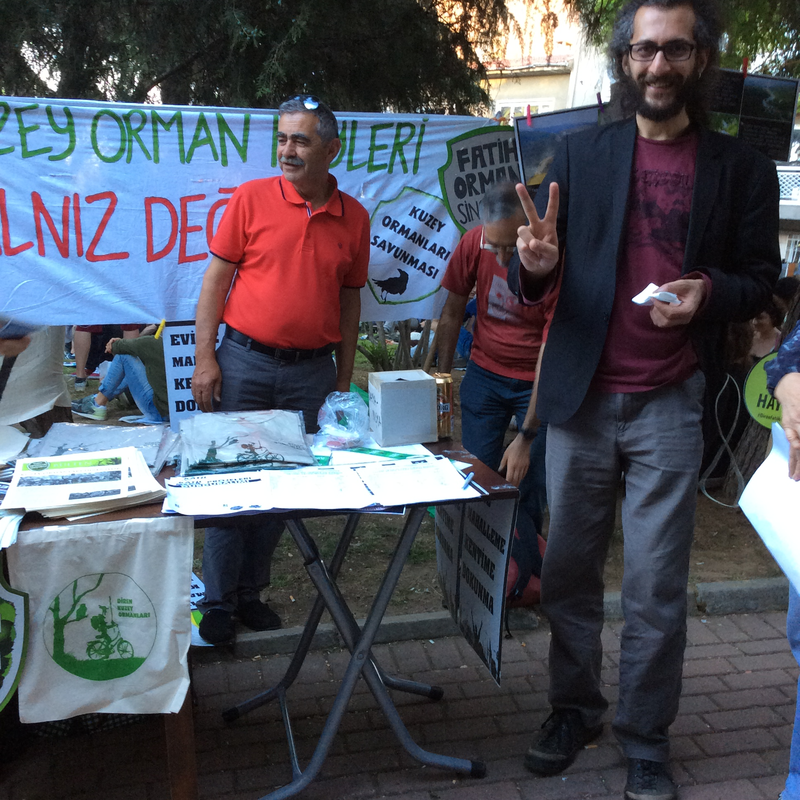 This action was organized by a local collective based out of Yeniköy, one of the hundreds of villages directly threatened by the project. With NDF/KOS coordinating participants from inside the city, the action drew over 100 individuals, with equal representation from local villages and the city center. Although this growing campaign of rural and urban solidarity has no official name yet, activists at NDF/KOS are optimistic about the collaboration. Northern Forests Defense (KOS) at the third anniversary of the Gezi uprising in Abbasaga Park, Istanbul. Source: Author. “This battle has to be fought by people in the city” Akgül impressed, “This project [of urban transformation] has two feet that work together. Once you have dug the city down to its roots, you have to do something with the waste material that you yourself have dug.” In this way, the destructive developments which threaten life within the city are interlinked with the destructive megaprojects outside the city, not just ideologically, but also pragmatically. With the recent loss of the AK Party’s majority in the Turkish parliament, the future of these megaprojects is uncertain. Progress on constructing the Bosphorus Bridge was recently postponed, and land expropriation for the 3rd airport was halted last month in a ruling by the Council of State. Meanwhile, Northern Forests Defense and Istanbul City Defense have committed to collecting and disseminating reports, news, photos and personal testimony. The next steps of the campaign are to inform the public about the projects, agitate residents within the city, and sound the alarm of international support. Through such grassroots mobilization, new life is being breathed into this ancient city. You can learn more about “Stop the Projects: Be the Breathe of Istanbul” at their website. * Eleanor Finley has been a student at the Institute for Social Ecology since 2011. She has a background in feminist activism and was a participant in the Occupy Wall Street Movement. Eleanor is a graduate student in anthropology at the University of Massachusetts, Amherst, where her research focuses on social movements, environment, and energy in Europe. She is currently conducting action-research within the Spanish anti-fracking movement, and interns with Environmental Justice Organizations, Liabilities and Trade (EJOLT) at the Autonomous University of Barcelona.